Michael is a native of Commerce. He graduated from Commerce High School in 2000. In 2001 Michael joined the US Army and served in Afghanistan and Iraq. He holds an Associates of Arts degree from NEO A&M College and a Bachelors of Arts degree from Pittsburg State University. 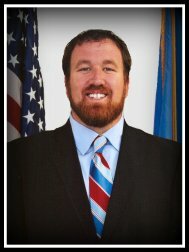 Michael was elected the Mayor of Commerce in July 2008, and re-elected in April 2011. He resides in Commerce with his wife Teresa and their children Austin, Lexi, Kayleigh, and Gavin.